We were running low on fresh vegetables mid-week, so I took a peek in the cupboards to discover a big bag of red lentils. 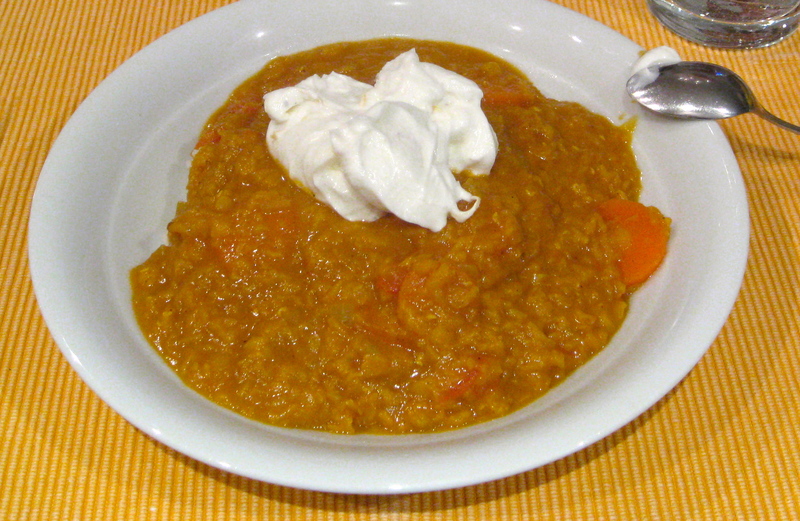 I had come across this Ethiopian recipe a few days before, so F and I, both lentil-lovers, decided to make it together. We enhanced the original recipe by adding a couple of carrots and we used a raw tomato rather than tomato paste. It cooks quite quickly and turned out to be tasty, healthy and filling; we served it over rice but it would be equally as good with some kind of soft naan-like bread. Upon first taste, my mouth was overwhelmed by the smoked paprika, but the zesty yogurt cut the taste and overall the dish grew on me as I continued to eat. We would definitely make this again but would probably alter the spice combination a bit, perhaps adding some cumin and toning down the paprika. Saute onions in butter in a big pot until they begin to get soft and brown. Add the ginger and garlic and cook for 2 more minutes. Add the spices, salt and pepper. 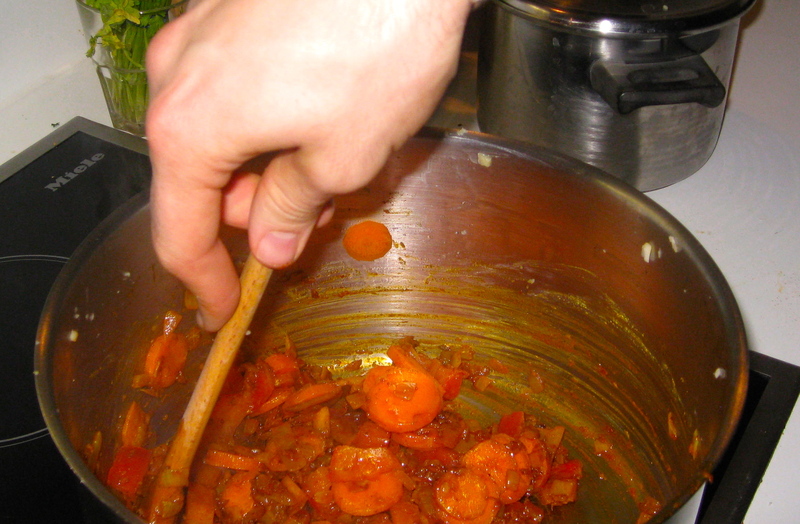 Mix together, then add the carrots and tomatoes, stirring for a few minutes. Uncover the pot, stir, and cook without a lid for 10-15 more minutes, or until the liquid has mostly evaporated. Serve over rice with a dollop of zesty yogurt on top. This entry was posted in food, full meals, health, pictures, recipes and tagged stew on 10.01.2013 by taplatt.